There’s a litany of options when it comes to three-row crossover SUV’s these days. Nearly all of them follow a similar formula: a boxy exterior design (to maximize interior space), an optional V-6 engine and all the options one could want. If it ain’t broke, don’t fix it. Well, it may not be a broken formula, but Mazda has deviated from it with its three-row CX-9. Mazda is known for churning out attractive looking vehicles. With its kodo design philosophy, basically every product in the brand’s portfolio is among the top of its class when it comes to subjective design. The CX-9 is no different, if not the best example of kodo at work. Designers gave the CX-9 a long hood that meets the grille a very pointed fashion, giving the CX-9 an aggressive appearance that mimics some luxury brands. A similar treatment has taken place with the rear, while a sweeping greenhouse and flowing lines attractively connect the two. Perhaps the biggest feat of Mazda designers here is that they’ve managed to design a three-row crossover that doesn’t actually look like one; a theme you’ll begin to pick up on as we unpack the rest of the CX-9. While it’s subject to some interpretation as to the level of premium found in the exterior design theme, the interior is less so. Mazda has crafted an interior space in the CX-9 that looks like it should be found in an Audi, not a mainstream consumer brand. Our top-of-the-line Signature tester featured premium materials, including open-pore wood trim and a trendy Auburn color palette. The fancy materials comprise an overall design that feels more car than crossover with a low dash panel and driver-centric cockpit feel. 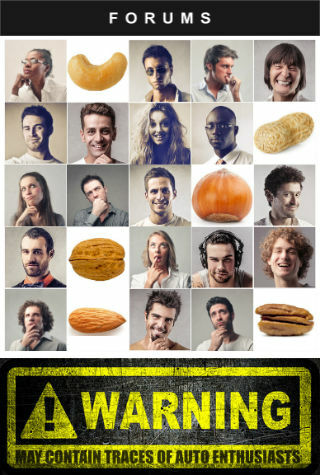 Fortunately it isn’t just a pretty face, either. Mazda’s control gear is not placed in usual locations. For example, the volume knob is found on the center console, not on the instrument panel. While there is an adjustment period to acclimate to the odd placement, it does prove to be ergonomically valuable. What isn’t ergonomically valuable in the CX-9 interior is the brand’s infotainment system. CX-9 owners get a seven-inch screen with the base model, while all other trim levels (including our tester) feature a larger eight-inch unit. While the screen size is fine, it can only be controlled by a control knob found on the center console; there’s no touchscreen. The lack of a touchscreen is paired with an infotainment software UI design that is clunky, unfriendly and a general hassle to use. This is a major sore spot on an SUV that is likely attracting younger, tech-savvy customers; the exact demographic that may find this infotainment system to be deal-breaker. Users have to flip between menu trees and screens to do simple tasks like switching from SiriusXM to USB, while there’s currently no support for Android Auto or Apple CarPlay, though Mazda says it’s coming. Mazda does gain some electronic redemption through the CX-9’s color heads-up display and 12-speaker Bose surround sound system. In fact, heads-up display can be hard to come by in this segment. Creature comforts are mostly par for the course in this SUV segment, and the CX-9 blends in in this regard. Higher trim levels feature a three-zone climate control system so rear passengers can control their own temperature destiny, while both front seat and second row passengers benefit from heated thrones. The driver also gains a heated steering wheel. Mazda is unfortunately only offering a standard sunroof in the CX-9, no panoramic option; an omission worthy of mention since our tester was pushing $50,000. Front and second row passengers will find solace in the comfort of the CX-9. Both rows’ seats are comfortable and supporting, with the second row in particular being on-point thanks to its relatively high placement. Third row passengers may groan a bit due to the limited headroom (a byproduct of the CX-9’s attractive exterior) and tight legroom. Buyers wanting the best possible third row are not going to opt for a CX-9. Buyers seeking the most cargo room behind the third row are also going to walk away from the CX-9. That said, there’s plenty of space back there for a couple suitcases or the proceeds from a mid-week trip to Costco, but it falls short of a Chevrolet Traverse or Honda Pilot. Taller buyers will want to be mindful of the CX-9’s liftgate as it’s relatively low and you will whack your head on it if you’re approaching six-foot. 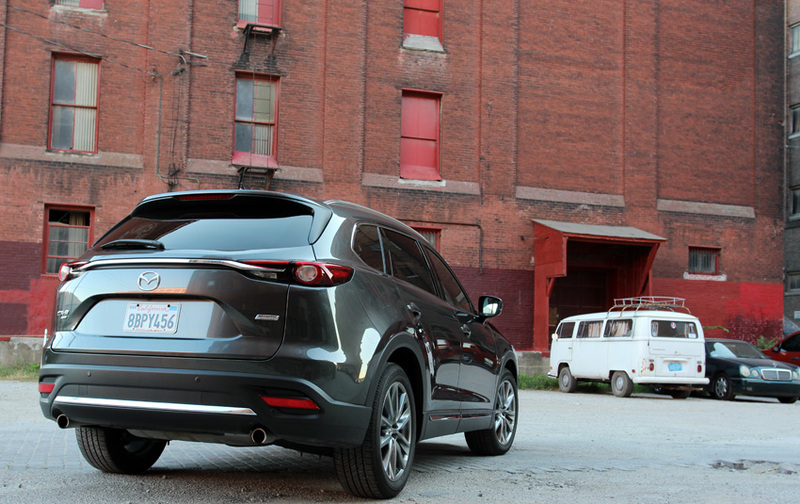 Even if you whack your head on the liftgate, driving the CX-9 will likely put a smile on your face. Despite its sheer size, this three-row crossover is a spirited one to pilot. Acceleration off-the-line is shocking for this vehicle class, while even mid-range acceleration is strong with the drive selector in sport mode. Basically, it drives like it looks: not like an SUV. Mazda used to offer a V-6 in the CX-9, but has since discontinued it for the brand’s turbocharged 2.5-liter four-cylinder. Rated at 227 horsepower and 310 pound-feet of torque, it isn’t a specifications sheet that’s going to excite anyone, but don’t judge this one by its numbers. It’s almost illogical how well this engine pairs with the big CX-9. In fact, it’s hard to explain. The little 2.5-liter offers enough low-end torque to keep the CX-9 constantly feeling like it has more than enough power to be fun. It’s also perfectly synced with an eight-speed automatic to make up for any statistical power deficit. The singular moment the CX-9 feels underpowered is in a full throttle situation, which buyers in this segment never see anyway. It’s not just the engine that makes the CX-9 a blast to pilot. The suspension does a terrific job at managing rebound, meaning the CX-9 never drives like its a three-row crossover. Rough pavement is nicely muted, but make no mistake, it doesn’t ride as cushy as a Toyota Highlander or Ford Explorer, which is good or bad depending on how much you hate driving. Mazda has tuned a steering rack in the CX-9 that feels more like a German car than a large crossover; it’s nicely weighted and offers a balance of ease-of-use and road feedback. Keeping you safe during the spirited driving you’re sure to do in the CX-9 is a host of active safety gear. In addition to the basics, our Signature tester featured adaptive cruise control, rear cross traffic alert, lane keep assist, smart braking control and blind spot alert. Each active safety feature performs like all the competition, but we did note that Mazda’s blind spot alert was oftentimes not accurate, particularly on multi-lane highways. 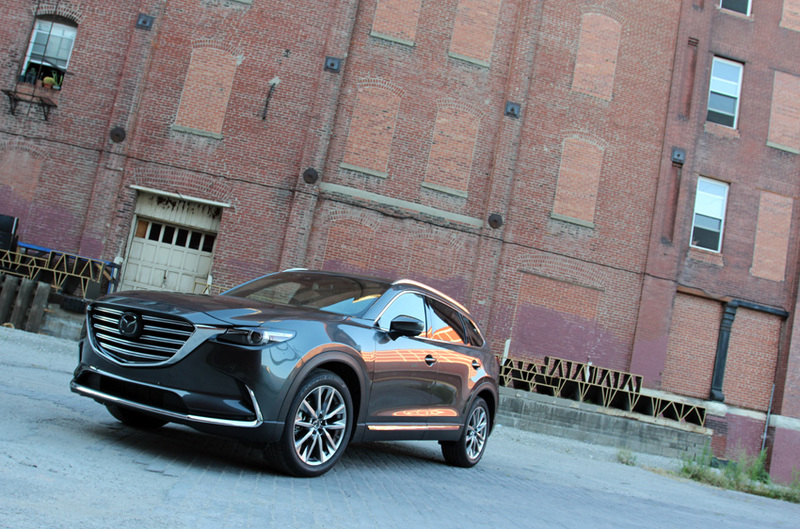 So, is the Mazda CX-9 worthy of consideration? Absolutely. For those seeking a three-row crossover, but want something unique and more fun than the competitive set, the CX-9 should be at the top of your list. CX-9 buyers will have to sacrifice a bit in terms of interior space and in regards to a few technology features, namely infotainment, but they are small compromises on an otherwise on-point people mover at a competitive price point. There’s a litany of options when it comes to three-row crossover SUV’s these days. Nearly all of them follow a similar formula: a boxy exterior design (to maximize interior space), an optional V-6 engine and all the options one could want. If it ain’t broke, don’t fix it. Well, it may not be a broken formula, but Mazda has deviated from it with its three-row CX-9.Mazda is known for churning out attractive looking vehicles. With its kodo design philosophy, basically every product in the brand’s portfolio is among the top of its class when it comes to subjective design. The CX-9 is no different, if not the best example of kodo at work. 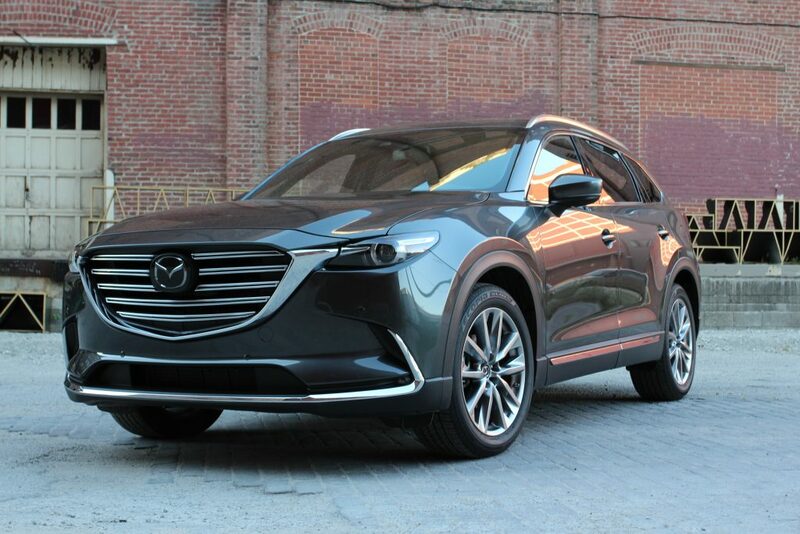 Designers gave the CX-9 a long hood that meets the grille a very pointed fashion, giving the CX-9 an aggressive appearance that mimics some luxury brands. 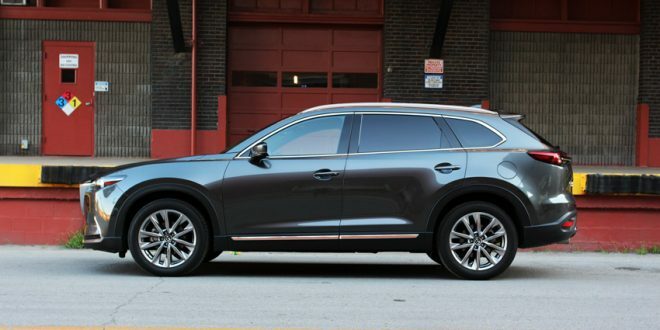 A similar treatment has taken place with the rear, while a sweeping greenhouse and flowing lines attractively connect the two.Perhaps the biggest feat of Mazda designers here is that they’ve managed to design a three-row crossover that doesn’t actually look like one; a theme you’ll begin to pick up on as we unpack the rest of the CX-9.While it’s subject to some interpretation as to the level of premium found in the exterior design theme, the interior is less so. Mazda has crafted an interior space in the CX-9 that looks like it should be found in an Audi, not a mainstream consumer brand. Our top-of-the-line Signature tester featured premium materials, including open-pore wood trim and a trendy Auburn color palette. The fancy materials comprise an overall design that feels more car than crossover with a low dash panel and driver-centric cockpit feel.Fortunately it isn’t just a pretty face, either. Mazda’s control gear is not placed in usual locations. For example, the volume knob is found on the center console, not on the instrument panel. While there is an adjustment period to acclimate to the odd placement, it does prove to be ergonomically valuable.What isn’t ergonomically valuable in the CX-9 interior is the brand’s infotainment system. 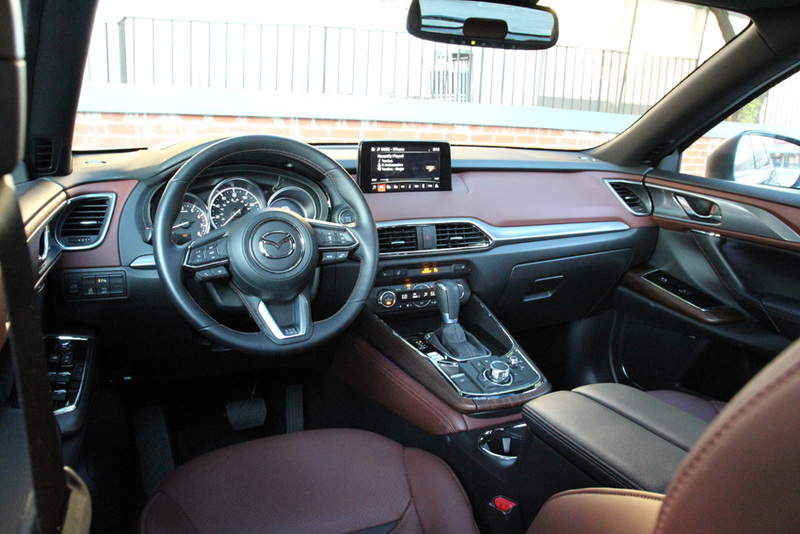 CX-9 owners get a seven-inch screen with the base model, while all other trim levels (including our tester) feature a larger eight-inch unit. While the screen size is fine, it can only be controlled by a control knob found on the center console; there’s no touchscreen.The lack of a touchscreen is paired with an infotainment software UI design that is clunky, unfriendly and a general hassle to use. This is a major sore spot on an SUV that is likely attracting younger, tech-savvy customers; the exact demographic that may find this infotainment system to be deal-breaker. Users have to flip between menu trees and screens to do simple tasks like switching from SiriusXM to USB, while there’s currently no support for Android Auto or Apple CarPlay, though Mazda says it’s coming.Mazda does gain some electronic redemption through the CX-9’s color heads-up display and 12-speaker Bose surround sound system. In fact, heads-up display can be hard to come by in this segment.Creature comforts are mostly par for the course in this SUV segment, and the CX-9 blends in in this regard. Higher trim levels feature a three-zone climate control system so rear passengers can control their own temperature destiny, while both front seat and second row passengers benefit from heated thrones. The driver also gains a heated steering wheel. Mazda is unfortunately only offering a standard sunroof in the CX-9, no panoramic option; an omission worthy of mention since our tester was pushing $50,000.Front and second row passengers will find solace in the comfort of the CX-9. Both rows’ seats are comfortable and supporting, with the second row in particular being on-point thanks to its relatively high placement. Third row passengers may groan a bit due to the limited headroom (a byproduct of the CX-9’s attractive exterior) and tight legroom. Buyers wanting the best possible third row are not going to opt for a CX-9.Buyers seeking the most cargo room behind the third row are also going to walk away from the CX-9. That said, there’s plenty of space back there for a couple suitcases or the proceeds from a mid-week trip to Costco, but it falls short of a Chevrolet Traverse or Honda Pilot. Taller buyers will want to be mindful of the CX-9’s liftgate as it’s relatively low and you will whack your head on it if you’re approaching six-foot.Even if you whack your head on the liftgate, driving the CX-9 will likely put a smile on your face. Despite its sheer size, this three-row crossover is a spirited one to pilot. Acceleration off-the-line is shocking for this vehicle class, while even mid-range acceleration is strong with the drive selector in sport mode. Basically, it drives like it looks: not like an SUV.Mazda used to offer a V-6 in the CX-9, but has since discontinued it for the brand’s turbocharged 2.5-liter four-cylinder. Rated at 227 horsepower and 310 pound-feet of torque, it isn’t a specifications sheet that’s going to excite anyone, but don’t judge this one by its numbers.It’s almost illogical how well this engine pairs with the big CX-9. In fact, it’s hard to explain. The little 2.5-liter offers enough low-end torque to keep the CX-9 constantly feeling like it has more than enough power to be fun. It’s also perfectly synced with an eight-speed automatic to make up for any statistical power deficit. The singular moment the CX-9 feels underpowered is in a full throttle situation, which buyers in this segment never see anyway.It’s not just the engine that makes the CX-9 a blast to pilot. The suspension does a terrific job at managing rebound, meaning the CX-9 never drives like its a three-row crossover. Rough pavement is nicely muted, but make no mistake, it doesn’t ride as cushy as a Toyota Highlander or Ford Explorer, which is good or bad depending on how much you hate driving. Mazda has tuned a steering rack in the CX-9 that feels more like a German car than a large crossover; it’s nicely weighted and offers a balance of ease-of-use and road feedback.Keeping you safe during the spirited driving you’re sure to do in the CX-9 is a host of active safety gear. In addition to the basics, our Signature tester featured adaptive cruise control, rear cross traffic alert, lane keep assist, smart braking control and blind spot alert. Each active safety feature performs like all the competition, but we did note that Mazda’s blind spot alert was oftentimes not accurate, particularly on multi-lane highways.So, is the Mazda CX-9 worthy of consideration? Absolutely. For those seeking a three-row crossover, but want something unique and more fun than the competitive set, the CX-9 should be at the top of your list. CX-9 buyers will have to sacrifice a bit in terms of interior space and in regards to a few technology features, namely infotainment, but they are small compromises on an otherwise on-point people-mover at a competitive price point. Summary: An attractive, fun-to-drive crossover with a few compromises.